Every August, the Clarkston Community Historical Society looks for volunteers to help with the annual Art in the Village show held in Depot Park in September on a Saturday and Sunday. 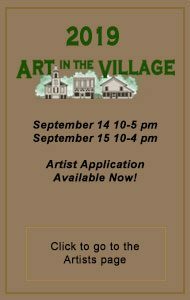 Art in the Village (previously Crafts & Cider) has been an annual event in the community for more than 40 years! The art show always promises a park full of favorite and new artists, yummy foods, a huge selection of antiques, the popular silent auction, entertainment, and of course, the traditional fall treat of cider and donuts! We would truly appreciate your donation of time. This is an excellent opportunity to work beside your tween, or for a teen, needing to complete community service hours. It’s also fun to get a group of friends, neighbors or co-workers to work all together during the same shift. We have four different tents to choose from: Cider & Donuts, Silent Auction, Merchandise and Antiques. The shifts are no more than 2 ½ hours and every volunteer is treated to complimentary cider and donuts and 10% off any merchandise purchase. Whether volunteering solo, with a friend or a group, it’s always fun and fulfilling to be part of this huge community event! Please let us know if you can help out during this fall event. You can email Jennifer Arkwright at jen.arkwright@yahoo.com or call 248-342-9837. Look for this year’s show date in the Art in the Village sidebar to the left. Thanks for considering sharing your time on behalf of the community. Proceeds from the show fund the Clarkston Heritage Museum and the Clarkston Community Historical Society. Put simply, our mission is to educate the community about the rich and unique history of the Clarkston area.